BAS Sign Solutions provides donor recognition solutions that help our customers publicly convey their thanks for the philanthropic support their organizations receive. No donation of any denomination needs go unrecognized. 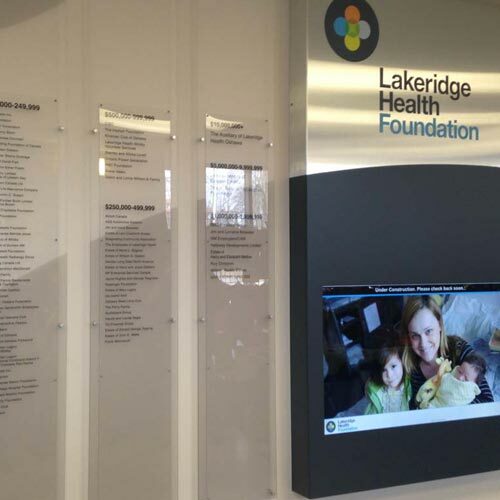 From static donor walls, digital screen formats, cut letters or a hybrid of all, we strive to provide solutions that seamlessly unite both fundraising and recognition efforts. Whether fundraising efforts are for capital campaigns or cumulative campaigns, we work collaboratively to bring vision and purpose together into inspiring solutions of lasting value. Our process insures all of the goals and communication and facility needs and objectives are considered, including aesthetics, functionality, design versatility and future adaptability. Together, with our knowledge of appropriate materials, methods, and technologies, we achieve recognition solutions that make the experience memorable and significant. We serve a number of markets including: hospitals and healthcare facilities, educational institutions, sports and entertainment venues, municipalities and townships, religious facilities and arts and cultural organizations. Interactive solutions capture and engage both visitors and donors alike. They allow for multiple forms of communication and messaging, and motivate participation in the donor program. Technological advances have allowed more and more the inclusion of electronic (both interactive and non) products within a recognition offering. Our web-based software offers our clients’ easy to-use-content management tools that allow for in-house updates to all of your on-going information and communication needs.